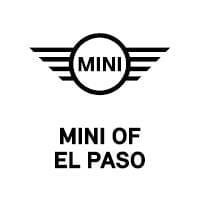 MINI of El Paso invites you to explore our MINI lease deals and new car specials in El Paso, TX. If you’re looking for only the best El Paso deals on new MINI small sports cars and crossovers, then look no further. Our friendly MINI leasing team is standing by to help you find the MINI special offer you need to drive away in a new vehicle today. Can’t find the MINI specials or lease deals you’re looking for? Contact us today for a personalized list of MINI offers in El Paso, TX. We are excited to offer this 2019 MINI Hardtop 2 Door. This MINI includes: BLACK ROOF TRANSMISSION: SPORT AUTOMATIC Transmission w/Dual Shift Mode A/T 6-Speed A/T ALL-SEASON TIRES Tires - Front All-Season Tires - Rear All-Season SIGNATURE LINE PACKAGE Keyless Start Transmission w/Dual Shift Mode Tires - Front All-Season Tires - Front Performance Aluminum Wheels A/C Climate Control Leather Steering Wheel Adaptive Cruise Control Generic Sun/Moonroof Power Door Locks Keyless Entry Tires - Rear Performance Sun/Moonroof A/T 6-Speed A/T Dual Moonroof Tires - Rear All-Season SIRIUSXM SATELLITE RADIO HD Radio Satellite Radio JCW LEATHER STEERING WHEEL Leather Steering Wheel ANTHRACITE HEADLINER HEATED FRONT SEATS Heated Front Seat(s) WHEELS: 17 Tires - Front Performance Tires - Rear Performance *Note - For third party subscriptions or services, please contact the dealer for more information. * Why spend more money than you have to? This MINI Hardtop 2 Door will help you keep the extra money you'd normally spend on gas. You can finally stop searching... You've found the one you've been looking for. Just what you've been looking for. With quality in mind, this vehicle is the perfect addition to take home. We look forward to seeing you soon! Please call us for more information.